May 22, 2012 - On September 16, 2011, at the National Championship Air Races in Reno Nevada a highly modified P-51D airplane, the Galloping Ghost piloted by James Kent "Jimmy" Leeward crashed while turning between pylons 8 and 9 on the race course. The airplane crashed on the ramp in the box seat spectator area, the pilot and 10 spectators were killed and more than 69 others were injured. Race organizers cancelled all remaining 2011 races after the accident. As a result of the crash the NTSB and the FAA have been involved in an intensive investigation into the causes of the crash and future safety measures that need to be put into place. NTSB Chairman Deborah Hersman announced that the agency was issuing a total of seven safety recommendations to make the National Championship Air Races a safer event for pilots and spectators. Now the question becomes as to whether or not the annual AirVenture Cup race will continue. The Reno Air Races, also known as the National Championship Air Races, take place each September at the Reno Stead Airport a few miles north of Reno, Nevada, USA. Air racing is billed as 'the world's fastest motor sport' and Reno is one of the few remaining venues. Experimental Aircraft Association (EAA) has stated Airventure Cup Race organizers has canceled future events while Airventure Cup Race organizers put the blame squarely on EAA. On May 11th the Experimental Aircraft Association (EAA) which is an international organization of aviation enthusiasts based in Oshkosh, Wisconsin issued a statement which stated ?EAA is stating the following in regards to the annual AirVenture Cup race, to clear up questions that have emerged regarding the reported cancelation of this year?s event. EAA did not cancel the AirVenture Cup race. The AirVenture Cup organizers opted to cancel this year's race. ?A group of EAA volunteers founded and have organized the race for more than a decade. The race completes its competition outside Oshkosh, with the competitors then flying together for a mass arrival during AirVenture. As part of the race, EAA does assist race organizers with volunteer benefits and exhibit space. ?Since last year, there have been discussions with race organizers on better defining the event and its relationship to EAA, including clarifying name and branding elements. EAA encouraged organizers to continue the race and will continue to offer race organizers volunteer benefits.? On May 18th Airventure Cup Race organizers issued the following statement regarding the Airventure Cup Race ?Over the past week, there have been many posts on social media sites and web forums regarding the 2012 Airventure Cup Race. This statement is meant to clarify and correct some of the statements that were made, as well as provide the public with information regarding the fate of this year?s race. ?Last week, we were contacted by EAA officials announcing they would no longer support air racing, including the Airventure Cup. This move was a shock to us as much as it was the rest of the aviation community and we are still in the process of evaluating our options to continue the race. However, in an effort to clarify some of the misinformation that was shared in the public forums, we would like to offer the following facts. ?It should be noted that the race was founded by EAA with direct support and influence by Tom Poberezny. Not long after its inception, we sought to minimize the impact of the race on EAA staff time by bringing in more volunteers to organize the race. In the last 7 years, the race has been run almost exclusively by volunteers and reported to various EAA staff members for certain projects when necessary. ?The current Airventure Cup logo design was developed in 2005 by race organizers with explicit direction from EAA officials, the design of which was approved, in writing, by EAA. ?Race insurance has always been provided by EAA. The insurance paperwork EAA requires from the racers and volunteers are unlike those required of other non-EAA sanctioned events associated with EAA and Airventure. This further supported our understanding that this was an official EAA event. ?EAA provided input on, and approved, the press releases we issued on behalf of the race, including a release issued as recently as February 21, 2012, calling it the, ?EAA Airventure Cup Race? - further supporting our belief that this was an EAA event. ?We understand there has been significant changes at EAA over the past year and believe the misunderstanding could be a result of the recent changeover. Regardless of these facts, we understand EAA?s position remains the same and no longer wishes to have their name associated with the race. As such, we have agreed to remove all references to EAA from the website and other marketing materials. We are pleased to report however, that EAA has agreed to continue providing support to race volunteers as they have done in the past, and we want to express our appreciation to EAA for doing so. ?With respect to this year?s race, we are happy to report that the Sport Air Racing League (SARL) has offered to help us and the race will take place this year as planned. Stay tuned for more information regarding the race in the coming weeks. ?In closing, the Airventure Cup Race staff would like to thank our volunteers, racers, sponsors, SARL and the many fans we have for the amazing outpouring of support these past few days. 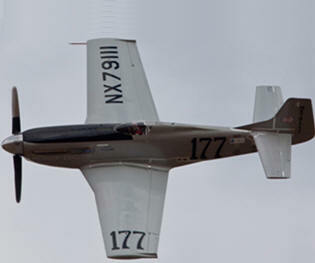 We are committed to keep air racing alive through the Airventure Cup Race this year, and for years to come.? "We are not here to put a stop to air racing," said Chairman Hersman. "We are here to make it safer." NTSB safety recommendations address race course design and layout, pre-race technical inspections, aircraft modifications and airworthiness, Federal Aviation Administration (FAA) guidance on air racing, the effects of g-forces on pilots, and ramp safety issues. They were issued to the FAA, the Reno Air Racing Association (RARA), and the National Air-Racing Group Unlimited Division. One key safety area highlighted during the investigation is the extensive modifications made to airplanes that race in the unlimited class and the lack of documentation and inspection associated with those modifications. On the Galloping Ghost, modifications included reducing the wing span from about 37 feet to about 29 feet, and significant changes to the flight controls all designed to increase speed and enhance racing performance.